The PADI Divemaster course is your first level of professional training. Working closely with one of our RAD PADI Instructors, you’ll fine-tune your dive skills, like perfecting the effortless hover, and refine your rescue skills so you anticipate and easily solve common problems. You’ll gain dive knowledge, management and supervision abilities so you become a role model to divers everywhere. As a PADI Divemaster, you’ll lead others as you supervise scuba diving activities and assist with diver training. Whether you want to work at a faraway dive destination or close to home at a local dive shop, the adventure of a lifetime awaits you! Diving is a sport that allows us to explore a part of the world that we can only visit for short times, but can catch our imagination for a lifetime. Too often, we find ourselves trapped in cubicles, daydreaming about the next time that we get to jump off of the boat, explore a reef or wreck and relax. If you find yourself sharing stories of your dives around the water cooler or tying to talk your friends and coworkers into joining you for that dive club meeting, then you might want to consider a career as a PADI Dive Master. 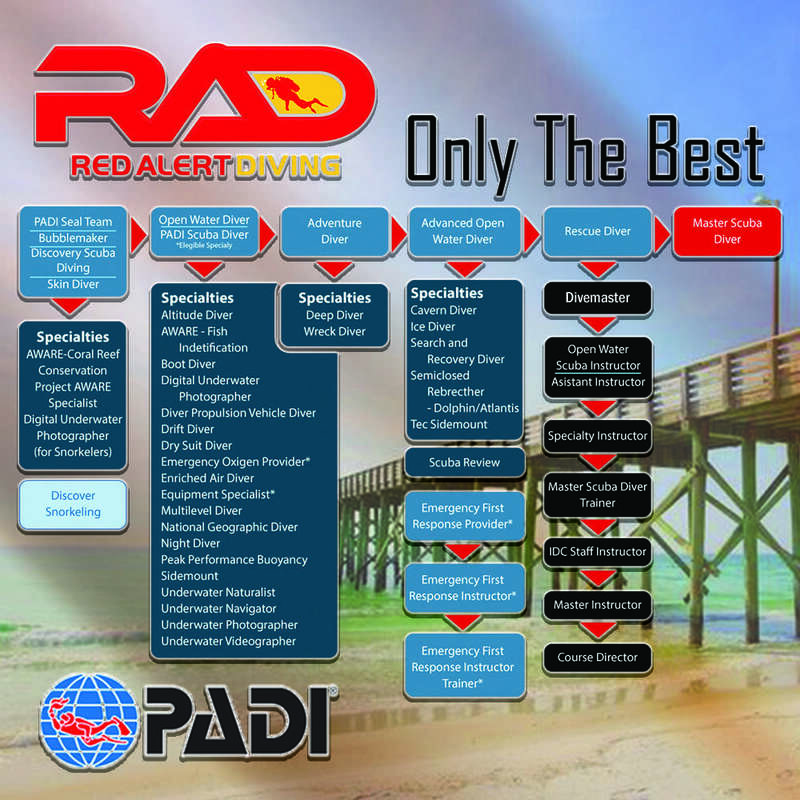 RAD’s dive master training program is your first step in professional scuba training. During training, you will fine-tune your dive skills, like perfecting the effortless hover, and refine your rescue skills so you anticipate and easily solve common problems. You’ll gain dive knowledge, management and supervision abilities, and learn all the aspects of dive center operations so that you become a role model to divers wherever you go. To get started, you need to be a Rescue Divers who is at least 18 years old. Sign up for dive master Online – PADI’s eLearning option – to start now. You can work through eight knowledge development sections using a web-based system that lets you learn at your own pace. You also have access to an online version of the Dive master Manual for reference during and after the course. Complete bookwork online before you arrive which translates to less sitting in the classroom and more diving. Please note that PADI charges $220.00 for the online class and our class price does not change. PADI Dive master is the prerequisite certification for both the PADI Assistant Instructor and PADI Open Water Scuba Instructor certifications.